You have never seen anything like these! Provides extended stone protection farther up the fender than any other mud flap. Install or remove in seconds. Fits front and rear of all '05-'12 F150's with factory fender flares including Lariat, FX4, Limited, Platinum, King Ranch and Harley-Davidson. 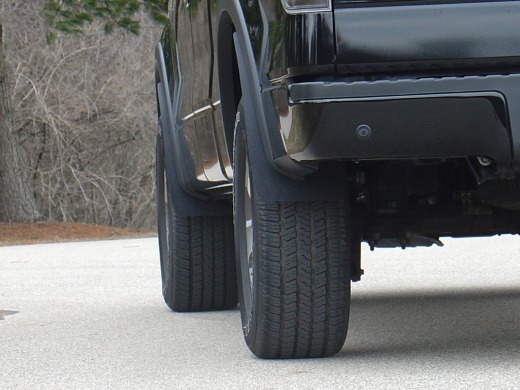 Fits rear only on '05-'12 F150's without factory fender flares, including XL, STX, and XLT. - JFlaps Instant Stone Guards. - These are Stone Guards for Trucks (not Mud Flaps). - Flexible heavy duty ABS bonded to soft EPDM rubber molding. Jaeger Brothers F-150 Stone Guards. Provides extended stone protection farther up the fender than any mud flap.